A super automatic espresso machine --- sounds intimidating, doesn't it? It brews espressos, cappuccinos, lattes, and tea, with 1oz to 8oz servings 1 or 2 cups at a time. This grinds, brews, and dispenses coffee all from a touch of a button. For cleaning and refilling, it conveniently rotates on its swivel base to gain easy access. And, to top it off, this is probably the most affordable of all super automatic espresso machines. 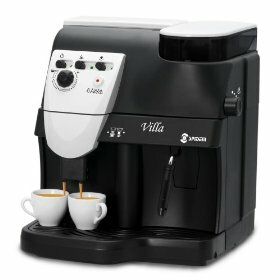 I'm talking about the Saeco A-SPV-BK Spidem Villa Super-Automatic Espresso Machine. Despite being "the cheapest" of its kind, this machine performs beyond expectations. However, since this machine is made of plastic, it doesn't seem to be built to last and might require some care when using. And, this machine is meant to be used at home since the reservoir and bean hopper are a bit on the small side. Nevertheless, if you're willing to make the leap to a super automatic espresso machine, this is one of the best choices out there.